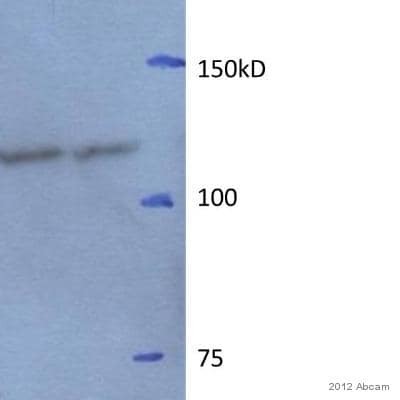 This polyclonal antibody detects a band approximately 120 kDa in Western blot under reducing conditions, corresponding to the C3 alpha chain. IHC-P: Mouse kidney tissue. 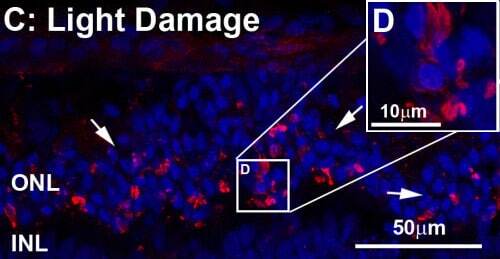 IHC-Fr: Mouse spleen and retina tissue. WB: Fibrotic mouse liver lysate. Our Abpromise guarantee covers the use of ab11887 in the following tested applications. WB 1/100. Detects a band of approximately 120 kDa under reducing conditions. Positive staining of paraffin embedded mouse kidney tissue with ab11887 at 100x dilution. Positive staining of frozen mouse spleen tissue with ab11887 at 20x dilution. Immunohistochemistry (Frozen sections) - Anti-C3 antibody (ab11887)Image from Rutar M et al., Journal of Neuroinflammation 2012, 9:257, 26 November 2012. Fig 5.; doi: 10.1186/1742-2094-9-257. Immunohistochemical analysis of rat retina tissue after bright continuous white light exposure, staining C3 with ab11887. Publishing research using ab11887? Please let us know so that we can cite the reference in this datasheet. Inquiry: Hi The mol wt of whole C3 protein is not 120 kDA. What is the 120 kDA protein that this antibody recognizes then- the iC3b? The 120 kD band is the C3 alpha chain. Do you wish running an ELISA was fast and easy? Check out our new SimpleStep™ ELISA, a single wash, colorimetric sandwich ELISA assay. Does this antibody recognize the alpha, beta, or both forms? Thanks. Thank you for your enquiry. I have been in touch with the source of this antibody and according to the information that they have ab11887 recognizes whole protein C3 but does not recognize C3a and C3b; resulting from the cleavage of C3 into its alpha and beta chains. I hope this information is helpful to you will be helpful to you. If you have further questions please do not hesitate to contact us.